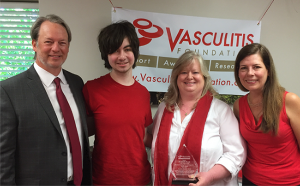 Nashville pediatrician earns annual VF award for making an early diagnosis of rare, autoimmune vasculitis in 16 year-old patient. Dr. Linda Brady, a pediatrician with Old Harding Pediatric Associates, Vanderbilt University Medical Center/Monroe Carrell Jr. Children’s Hospital, Nashville, Tennessee, has been selected as the 2018 Excellence in Diagnosis (V-RED) Award by the Vasculitis Foundation. 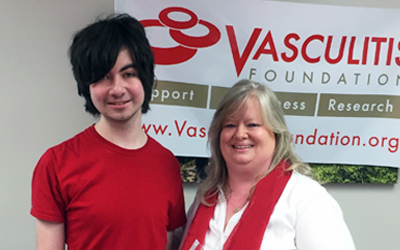 The V-RED Award is presented annually to a medical professional who made a quick diagnosis of vasculitis, thus enabling the patient to receive timely and appropriate treatment, potentially sparing the patient permanent and ongoing health complications. Dr. Brady was nominated by Lisa Crabb, the mother of Chip, who was diagnosed with Granulomatosis with polyangiitis (GPA/formerly Wegener’s) in September 2017. Chip began exhibiting what appeared to be a chronic cold in August 2017. However, when he did not respond to treatment and began to have pulmonary issues, extreme fatigue, and hearing loss, Dr. Brady ordered more testing and brought in other specialists to evaluate Chip’s condition. An ultrasound ultimately revealed autoimmune vasculitis which was immediately treated with high doses of prednisone and Rituxan. Today, Chip is in remission and has tapered off of the steroids. Lisa credits the tenacity of Dr. Brady for making an early diagnosis that ultimately improved the outcome for her son. Lisa nominated Dr. Brady for the special award because she believes it’s important to raise awareness about vasculitis, and especially improving the rate of early diagnosis that continues to be one of the major challenges for patients. In addition to Dr. Brady, there were 41 other medical professionals nominated for the 2018 award throughout the world. Three of them were selected for Honorable Mention, and all of the other nominees were given a certificate of appreciation by the VF.